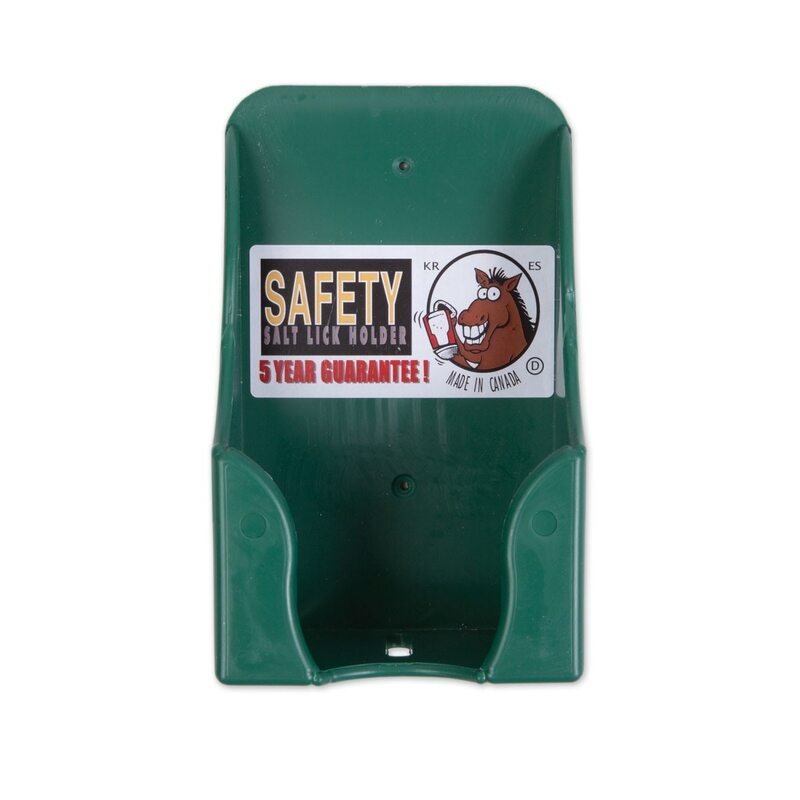 Nearly indestructible, the Safe-T Salt Block Holder is made from one piece of molded plastic making it hard for horses to chew. Will fit any 2" x 4" salt blocks. 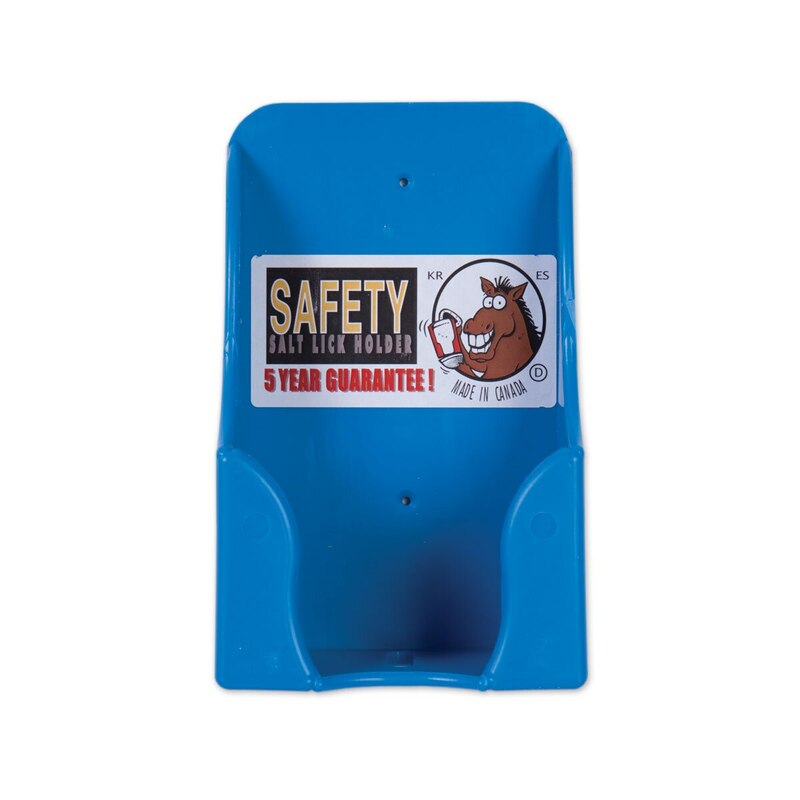 Safe-T Salt Block Holder is rated 4.6 out of 5 by 90. Rated 5 out of 5 by Liz Up North from Great product! 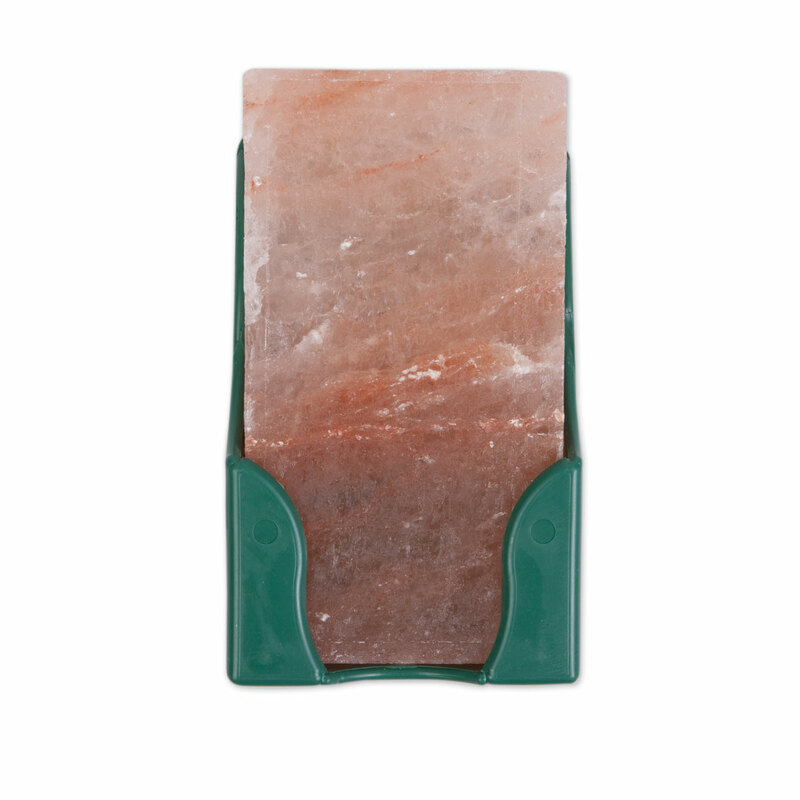 My metal salt block holder broke recently leaving a sharp edge in my mare's stall. We decided to replace the metal holder with this plastic Safe-T holder which has been working out great for two months now. The salt brick is held securely even as the size of the brick shrinks down with the horse's licking. She has rubbed her fanny on it without breaking the holder. There are no rough edges, and it was easy to install. Keep in mind that metal corrodes with exposure to salt. Plastic does not corrode. 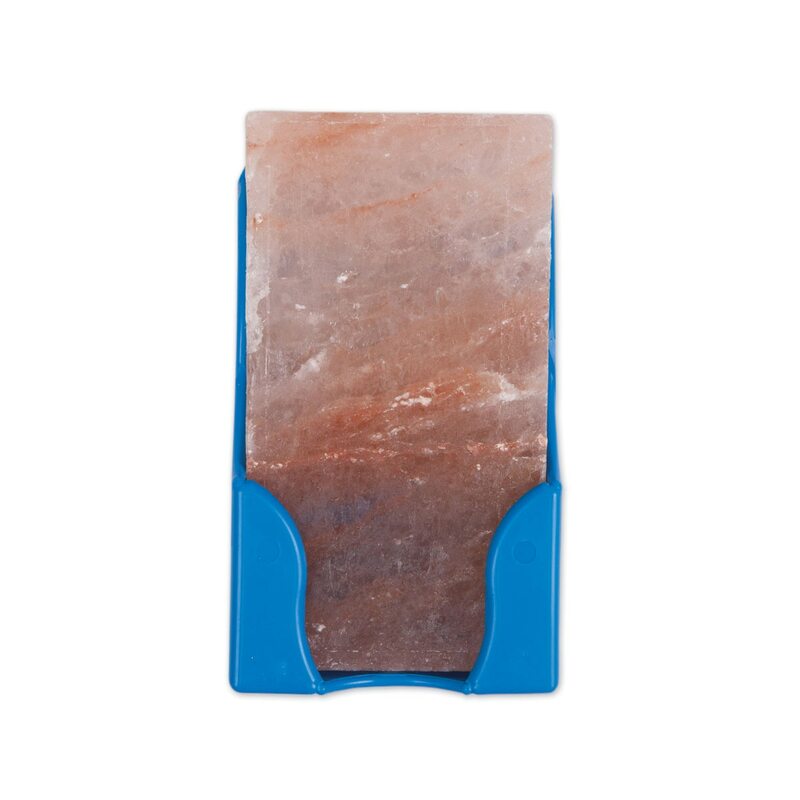 Rated 2 out of 5 by AnnE from Couldn't use it I bought this to hold one of the Himalayan salt blocks sold by SmartPak. Unfortunately, the block is considerably larger than the description says, and there's no way the block will fit in this holder. If you plan to buy this holder, be sure to check the dimensions of what you want to put in it. Rated 4 out of 5 by blancosmom from I love this, but... leave it to my horse. He chewed the wings off the bottom sides! (obviously not a manufacture issue, just an issue with my plaayful horse). Despite this, it STILL holds the salt block securely. I bought another, (the price is right) and I'll replace the chewed one if it ever fails to hold the block securely. My horse loves the access it gives to the block and there's no rusting problem. Rated 5 out of 5 by Holly mom from Love Them! Can’t say enough a great idea .!! Tried one and came back For 6 more! Rated 3 out of 5 by Laurie Anne from Little on the small size Little on the small size. I had to shave off some of the block inorder to get it into the holder. Rated 5 out of 5 by Calvin48 from Tough and safe I have been using these salt holders for years and they are just perfect. The screws I put them up with rust out before the holder breaks. I still have the first one I bought 10 or15 years ago. I’ve never had a horse injured or caught up on one. Rated 5 out of 5 by jibimom from Great item I bought several of these to replace old metal corroding ones in my stalls. They are great. I like theat they keep the salt from falling out should the block break. Buy them when they are on sale as they are pricey. I wish they would come in more colors like the buckets do. Rated 3 out of 5 by NLJs from Salt block holder I bought this, thinking I would put the salt in it, but I ended up putting the salt in the feed bin. I'll keep the holder in case I can use it later. Rated 5 out of 5 by Sanluka12 from Love it! I bought this after my metal one corroded and I am very glad I did! My horses love it and it's durable! Rated 5 out of 5 by Barbara from Just what I was looking for I like this type of salt brick holder because it doesn't break easily or rust, and it prevents the brick from falling out when it gets smaller. It is a bit too pricey, but worth it for the value.